Catalytic Oxidizers are an effective treatment solution for the control of Volatile Organic Compounds (VOCs). A catalyst bed enables operation at lower treatment temperatures (330˚C - 600˚C) than thermal oxidation. The VOC’s are mixed with dilution air, electrically heated to reactive temperature, and then pass through a precious metal catalyst where they are safely converted to CO2, H20, and heat which is then recovered through a heat exchanger. 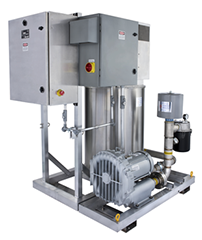 Falmouth Products specializes in the manufacture, sale and rental of catalytic oxidizers and remediation equipment for destruction of organic vapors. 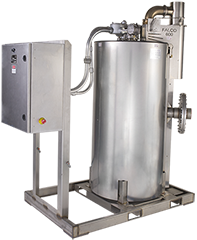 FALCO electric catalytic oxidizers are used fortreating vapor emissions from Industrial Process vapor streams and soil vapor extraction systems. 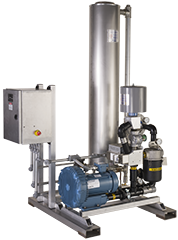 Integrated catalytic oxidizer designs provide rugged, lightweight, and portable units that are easily installed and operated. A heat exchanger provides efficient heat recovery for energy savings when processing low concentration vapor. 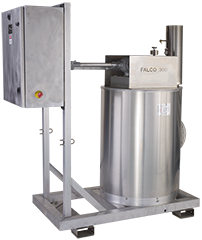 FALCO electric catalytic oxidizers can be supplied alone, or with blower packages to make economical, low profile vapor extraction and treatment systems. FALCO catalytic oxidizers are competitively priced relative to activated carbon and thermal oxidation. FALCO electric catalytic oxidizers have wide applications, including treatment and destruction of vapors from Industrial VOC abatement, Soil Vapor Extraction, Remediation equipment, Dual phase extraction, Air strippers, Pump and Blower seals, Odor control, and Tank purging. 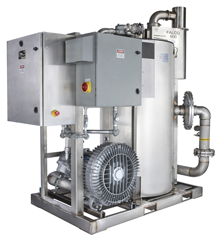 Falmouth Products has manufactured over a thousand reliable FALCO electric catalytic oxidizers. Catalytic oxidizers are available for purchase and Rental. Used Catalytic Oxidizers are also available. We can assist you with your installation on site or over the phone. Our office hours are 7 AM - 5 PM USA EST, and we will be happy to answer any questions.